SPRING SEMESTER BEGINS FEBRUARY 5TH!! NEW STUDENTS - REQUEST YOUR AUDITION TODAY!! Guitar Ensemble, SCV Brass Ensemble and Chamber Music. Our goal is to provide young musicians an exemplary musical education and performance opportunities through expert instruction in an ethnically diverse setting, thus enriching the cultural life of the Santa Clarita Valley and beyond. Congratulations to members of our Chamber Music Ensemble, under the direction of Rachel Iba, MFA, who performed at the Westfield Valencia Mall as part of the "Old Glory Relay" sponsored by Team Red, White & Blue. Our musicians played a variety of popular and patriotic pieces for the enthusiastic crowd! KEEP THE MUSIC ALIVE - DONATE !!!! be recognized in our programs and on this website. Thank you to David Sukonick, Bolo Productions, for videography, editing and production of this recording. Duex Interludes by Jacques Ibert, performed 05/14/2017. Featured are members our newly established Santa Clarita Valley Youth Orchestra Chamber Music Ensemble; under the direction of Rachel Iba, MFA. See photos from our Summer Music Camp Extravaganza 2017 - 4 days/3 nights at Teresita Pines at Lions Camp in Wrightwood, followed by two weeks of daily rehearsals at College of the Canyons. Finale Pizza Party and concert conclude our annual Summer Session. 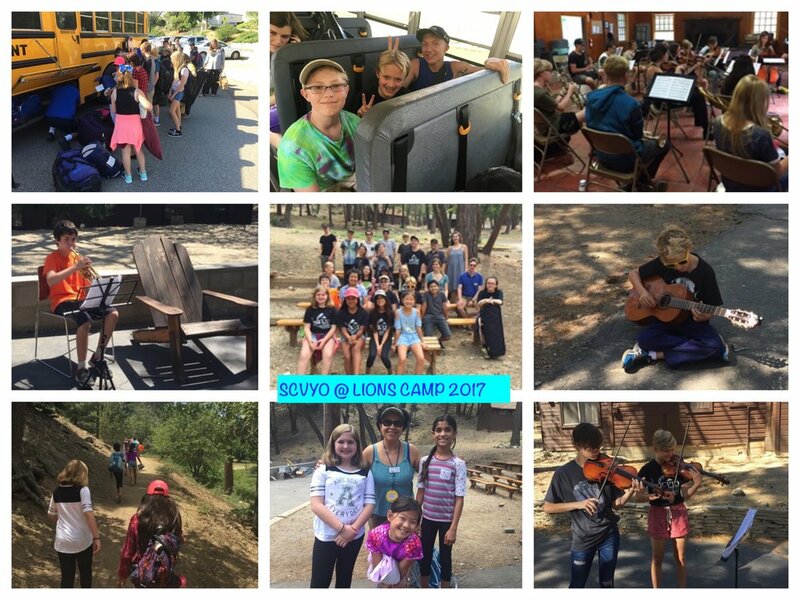 Visit our Flicker Account to see more exciting scenes from our 2017 Summer trip to Lions Camp, and many other exciting activities our young musicians participate in as a member of the SCVYO. Come for the Music - Stay for the Friendships! !